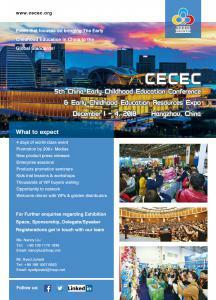 Asia's Leading Early Childhood Education Event! BEIJING, CHINA, November 9, 2018 /EINPresswire.com/ -- 5th China Early Childhood Education Conference & Early Childhood Education Resources Expo has established itself as a front-runner in the Early Childhood Education in a short span. A yearly event that is held in renowned cities of China bringing together experts from all around the world to share their expertise with a large audience during the numerous sessions of this conference. The Expo hosts a wide range of Early Childhood Education industry innovative products and services. The event also provides opportunities for distributors and suppliers to hold one on one meetings, activities for kids, Kindergarten tours and opportunity for businesses to present their products/services to an array of audiences. This year's theme revolves around the global strategies and methodologies being applied in early childhood education, and how they can be beneficial for Chinese early childhood education industry. The conference brings globally known and experienced speakers from the industry to learn from their expertise and follow the international early education landscape. The conference sessions will be focusing on 17 major topics varying on the speaker expertise and more than 250 sessions will be conducted during the period of four days, expo will bring together more than 450 exhibitors to showcase their products/services to a wide range of attending audience. Early Childhood industry in China has become one of the biggest ECE industry in global percentage, it holds major chunk of the industry and it still has a huge ceiling as it continues to grow rapidly. China is in the forefront of development in the education industry and there are year round trainings, seminars, workshops, conferences and Exhibitions conducted to showcase and learn from the global experiences and expertise.